Sikhism took birth in the East in Punjab, India, five centuries ago. Sikhs have settled all over the world not as conquerors of new lands. as the Europeans did four centuries ago, but as seekers of new opportunities in life. With them, the Sikhs carried their unique appearance and their unique philosophy. To the West, Sikhs migrated in the later part of the nineteenth century. Wherever they went, they established their gurdwaras (worship places). In the first two decades of this century gurdwaras were founded in Vancouver, Canada, Stockton, USA, and London, U.K, to name a few. Now almost all large cities in the West have a gurdwara; many have more than one. Gurdwaras in North America formed their Sikh Council in 1979. They got together annually to discuss Sikh affairs in the West. 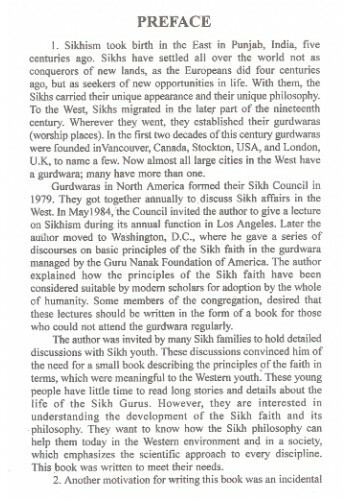 In May 1984, the Council invited the author to give a lecture on Sikhism during its annual function in Los Angeles. Later the author moved to Washington, D.C., where he gave a series of discourses on basic principles of the Sikh faith in the gurdwara managed by the Guru Nanak Foundation of America. 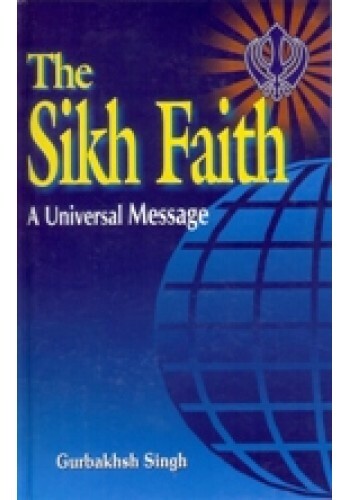 The author explained how the principles of the Sikh faith have been considered suitable by modern scholars for adoption by the whole of humanity. Some members of the congregation, desired that these lectures should be written in the form of a book for those who could not attend the gurdwara regularly. The author was invited by many Sikh families to hold detailed discussions with Sikh youth. These discussions convinced him of the need for a small book describing the principles of the faith in terms, which were meaningful to the Western youth. These young people have little time to read long stories and details about the life of the Sikh Gurus. However, they are interested in understanding the development of the Sikh faith and its philosophy. They want to know how the Sikh philosophy can help them today in the Western environment and in a society, which emphasizes the scientific approach to every discipline. This book was written to meet their needs. Sikh rites at the time of a birth, marriage or death in the family. With rapt attention, the author heard this emotional description of the Sikhs in U.P. from a person longing to retrieve his lost heritage. The author is reminded of it every time when he comes across Sikh children without turbans. The strong fear, that most of the next Sikh generation in the West will be without Sikh symbols and that their children may know little of the Sikh faith, haunts the author all the time. Many Sikh parents in the West are constantly worried by the same thought. In fact they fear that the Sikh symbols will fall into disuse in the West even faster than in U.P. Many first-generation immigrants to Europe and America have already removed their Sikh symbols, while it were the third or fourth generation Sikhs who did so in U.P. The language barrier will further hasten this trend. Many Sikh children born in the USA, U.K. or Canada read Gurbani; some cannot even speak Panjabi properly. Instead of simply feeling alarmed by reading these observations, we should make efforts to check this trend. If we, the parents, the first and second generations immigrants, resolve to live as Sikhs and guide (not by force, but through education and example) our children to the Sikh way of life, we can feel assured that Sikhism will be retained as the religion of the future generations. This will bring peace not only to the Sikh youth but also to all those who came in contact with them. 1. Hundreds of North American Sikh youth trained at the Sikh heritage camps started in 1970, not only understand the greatness of their faith. but they can also explain it to their friends of European origin. They are happy to wear the Sikh symbols. Many of them now (1998) are doctors, professionals, engineers, teachers, etc. They act as good role models for other youth. They motivate other Sikh youth to enjoy the self-esteem of living like a Sikh and appearing like a Sikh. Many of them can recite, sing and interpret Gurbani. Further, they can also relate it to their lives. Though, there is no formal survey, but many people, based on their observations, agree that a higher percentage of North American youth can sing Gurbani than those in their homeland, Panjab. sportsmen, top scientists, successful businessmen, excellent workers, faithful followers of the religion and saviors of the poor helpless people. The knowledge of their glorious past will help the Sikh youth, presently not interested in their faith, to feel a sense of pride in being Sikhs. They will develop a desire to possess the virtues they inherited from their forefathers. After comprehending Sikhism and its glory, young Sikhs may express their surprise in these words. are His. The Guru surely was much ahead of his time. 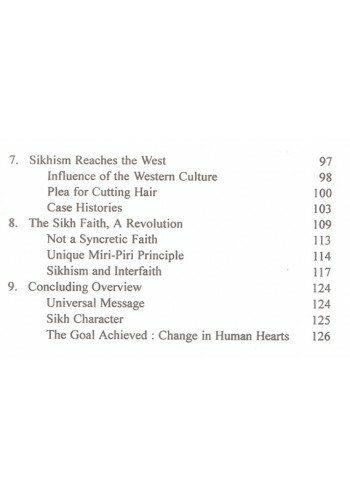 By his present efforts for revitalizing Sikh thought in the West, the author is honoring a promise he made a long time ago. In 1949, when the author himself was young and studying at Khalsa College Amritsar, he listened to a lecture by Sant Teja Singh (Professor). He was sent by Sant Attar Singh of Mastuana to U.K. and other countries in 1905 to establish Sikh organizations there. Sant Teja Singh advised the Sikh youth to study the faith devotedly, attempt to live up to it and explain it to the youth in the West. The author was a member of the group of students who met the Sant after his lecture to seek guidance and training in taking up this responsibility. This effort to explain the glory of the Sikh faith is intended to fulfil the promise made by him in 1949. A non-Sikh, interested in understanding Sikh philosophy and Sikh history, will also find this book quite useful and interesting. 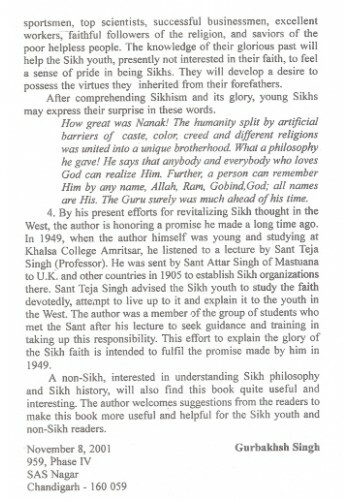 The author welcomes suggestions from the readers to make this book more useful and helpful for the Sikh youth and non-Sikh readers. 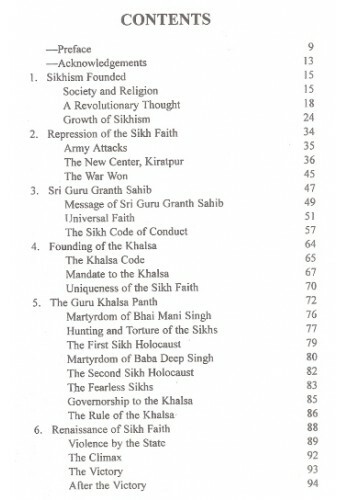 Table Of Contents For (Part I) 'Teaching Sikh Heritage to The Youth-Book By Gurbaksh Singh ..
Table Of Contents For 'Sikh Religion and Culture' Book By Dewan Singh ..
Summary Of 'Sikhs Under Brahmanical Siege' By Dr Gurbakhsh Singh This book was originally..
Foreword To The Book 'The Sikh Faith - Questions and Answers' By Dr. Gurbakhsh Singh During t..